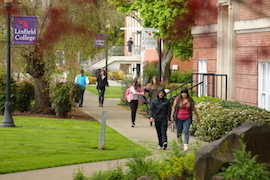 A new nationwide study of anonymous tax returns and tuition filings found that Linfield College is among the best in the Pacific Northwest when it comes to admitting students from disadvantaged families and helping them move up the economic ladder. The study, called “The Equality of Opportunity Project” and conducted by a group of researchers from Cal-Berkeley, Stanford, Brown and the U.S. Treasury Department, developed a new measure it calls the mobility rate. 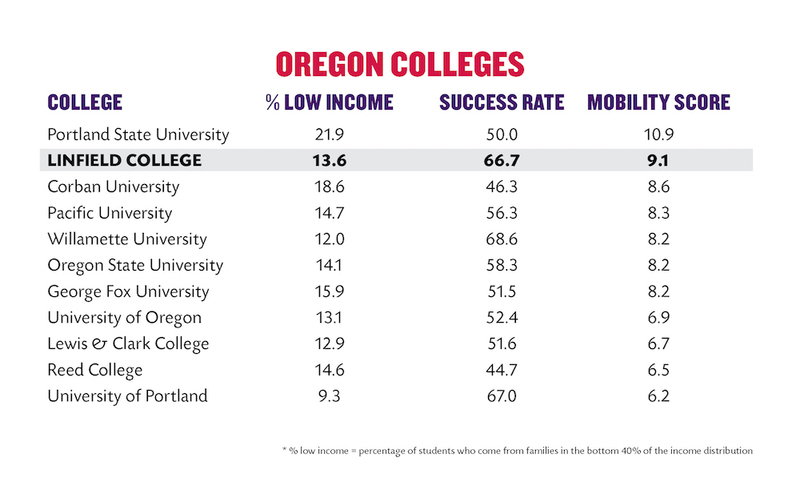 It calculated a score for each institution based on the college’s share of students from lower-income families (bottom 40% of the income spectrum) and its success at propelling them into upper-income (top 40% of the income spectrum) career paths. 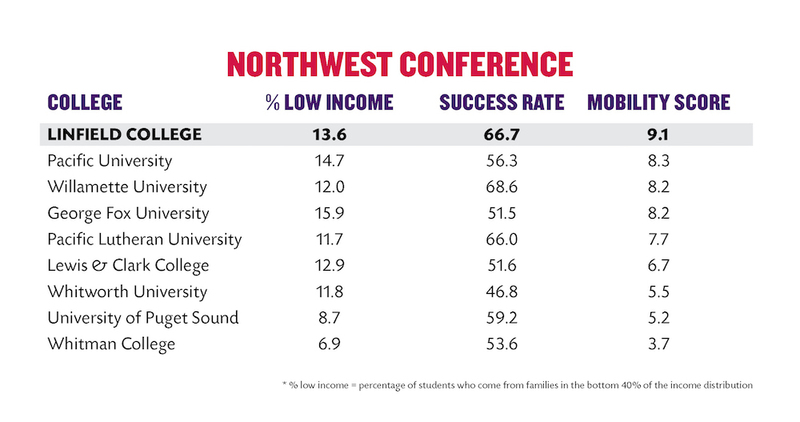 By that measure, Linfield outpaced each of its peers in the Northwest Conference, and almost all private colleges in the region. It finished in a virtual tie with Seattle University for the top spot. 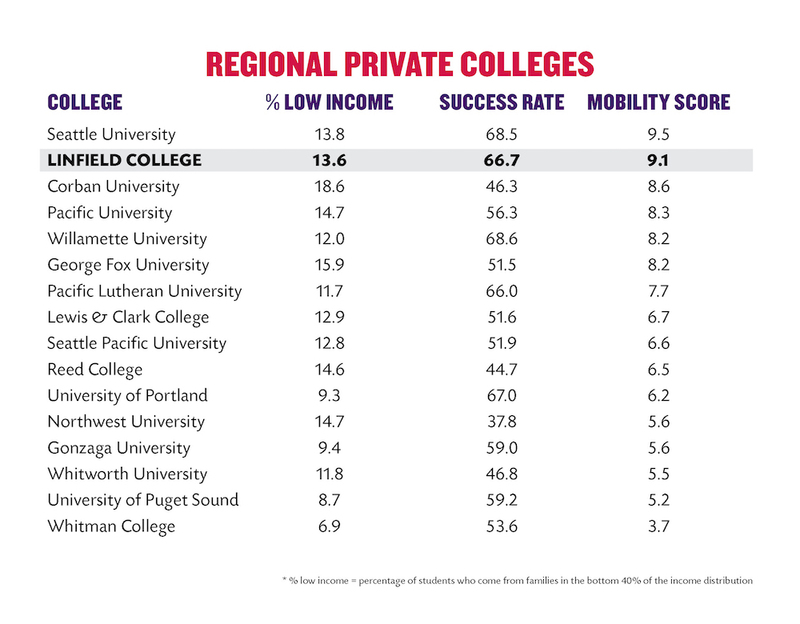 Bringing in other private colleges and large public universities in Oregon, Linfield still shines, with a higher mobility rate than all except Portland State. 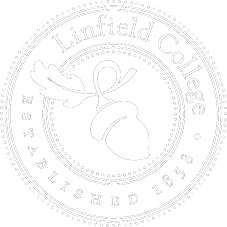 A 2015 study from The Economist magazine ranked Linfield 27th nationally out of 1,275 colleges and universities when it comes to the economic value of its degree. See the following three charts for a breakdown of the mobility-rate study.